We also use some non-essential cookies to anonymously track visitors or enhance your experience of the site. If you're not happy with this, we won't set these cookies but some nice features of the site may be unavailable.Some cookies on this site are essential, and the site won't work as expected without them. These cookies are set when you submit a form, login or interact with the site by doing something that goes beyond clicking on simple links. Monday - Thursday 9-8pm, Friday 9-6pm, Saturday 9-5pm, Sunday 10-4pm. Click here to request a copy of our NEW 2013/14 Cruise Collection! Please click here to view an online version of our latest brochure now! Discover the world’s largest tropical rainforest and most diverse ecosystem with a thrilling exploration of the magnificent wonders of the mighty Amazon. 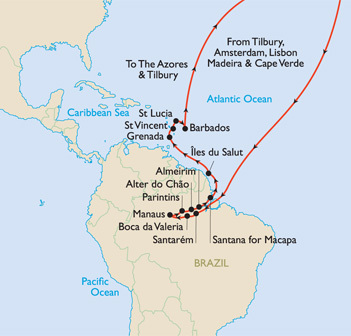 En route, call at Lisbon and Madeira before reaching the Cape Verde Islands in the mid-Atlantic. No less than eight calls along the Amazon River unfold a land of stunning vistas, tropical plants and remarkable wildlife. Visit Îles du Salut and five sun-splashed Caribbean islands before returning home via the Azores, with memories of a truly magnificent adventure. Explore Amsterdam before sailing to Lisbon, an historic and architectural treat, and Funchal on beautiful Madeira. From Mindelo, in the remote Cape Verde Islands, you head for Brazil and bustling Santarém, gateway to the Amazon River. A call is made at the Indian community of Boca da Valeria before reaching Manaus where an overnight stay offers fascinating tour options such as a riverboat cruise where you may see the incredible ‘Meeting of the Waters’. In Parintins don’t miss the optional Boi-Bumba Festival Show featuring spectacular costumes and infectious rhythms, and on the Rio Tapajos where it joins the Amazon, a blue lagoon is the setting for the little fishing village of Alter do Chão. Continue to Almeirim and Santana for Macapá on the Amazon Delta on your return to the Atlantic. Relax at sea before reaching Îles du Salut, a former penal settlement (Devil’s Island) made famous by the film Papillon, and continue to Grenada with its pretty capital of St. George’s. Discover scenic St. Vincent in the Grenadines, once the realm of pirates and St. Lucia, a stunning volcanic island with green jungles and pretty blue coves. Barbados, with its mix of the familiar and the exotic, provides a warm farewell to the Caribbean. On your homeward voyage discover the Azores with calls in tranquil Horta and Ponta Delgada before returning to Tilbury. Cruise & Maritime Voyages create a very relaxing atmosphere which is ideal for enjoying our extensive programme of Guest Speakers, entertainers and craft specialists. Guest Speakers on this cruise include the following subjects; Amazon, Journalism & Maritime History. We are excited to confirm that Guest Speaker Brian Ford will be joining us again for our mighty voyage to the Amazon, West Indies and Azores this January. Brian Ford is a leading scientist and writer. He is on television around the world, recently featuring on national television news with his just-published book on WWII, ‘Secret Weapons’. Please click here for more information about Brain Ford. This cruise is a ‘Supercraft’ cruise. With arts and crafts growing in popularity, we are including sessions on all CMV cruises of five nights or more. Specialists will be delighted to demonstrate their talents replicating many of the growing number of new crafting skills now witnessed on dedicated TV channels. These may include millinery, bead jewellery, mosaic decoration, calligarphy and decorative card art. Save up to 25% on this cruise, plus the second passenger travels for just Half Price, on the following Ocean View Cabins Categories; Category 9 (Superior Ocean View), Category 11 (Superior Plus Ocean View) and Category 12 (Premium Ocean View). For full details please click here. Hurry limited availability and offer must end on Monday 3rd December 2012! Watch more videos, about CMV, our ships and our cruise collection. 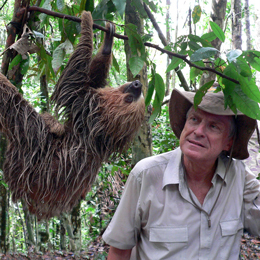 Travel Journalist, Jim Pybus takes Marco Polo's voyage of the Amazon, West Indies & the Azores. Click here to read all about his amazing adventure and see some of his photographs. Please note a Yellow Fever vaccination is required for this voyage. Notes: Coach service from London Victoria to the London Cruise Terminal in Tilbury available - £25.00 per person (Return) £12.50 per person (Single). Port Parking available - £9.00 per vehicle per night (Total £252). Must be pre-booked. Please note a Yellow Fever vaccination is required for this voyage. All holidays featured on this website are financially protected by South Quay Travel & Lesuire Ltd, trading as Cruise & Maritime Voyages.